What I need to do is more of a general question and not a problem per say. I want to be able to add my own custom videos into the mix for the Integrated Video Tutorials plugin. The reason is simple... several of the sites I currently run and a few I have planned, have some specific plugins and/or features that are not covered in these videos. Examples are your custom plugins such as events, appointments, e-commerce, etc. Third party examples would be a custom post type I created for the site, or other third party plugins. The point is, these videos only cover the basics of WordPress and while that's great, it inevitably will leave holes in the training provided for many many wordpress sites. My solution is quite simple and one that WP 101 already employs. That is to allow us users to insert our own videos with embed codes. With this function, we can simply create our own videos for these custom features as that wouldn't make sense for you to provide, then insert a code from Vimeo or such and viola... custom training videos. I feel that this is a pretty high priority item for me. Please let me know if and when it can be done. I know I mentioned WP 101, which I would simply switch to for this function, but they are not multi-site so each sib-site will have to enter the API code, plus admins would be able to see the nature of where these videos come from which is not something I want. There isn't any Integrated Video Tutorials plugin option to add our own custom videos but we have developed some hooks in the plugin as mentioned in the following reply which can be used to develop custom code and achieve it. I will move this over to the features & feedback section. This way it can be considered for future development depending on the number of feature requests it get from members and we can also see what other community members think about the feature request but We don't publish ETAs to prevent disappointment if a deadline is missed(which in plugin development quite a frequent occurrence!). Thanks for the response. Well, that comment on the other post is a little underwhelming. While it does sound like there is a solution, it doesn't appear to be actually listed there. This person mentions that there have been hooks made to enable it, but no mention of what the hooks are, the best methods to use them and/or example snippets, nothing. It's sort of like a researcher saying "oh yeah... I just cured cancer", but offering no further details into how. Sorry for the over the top analogy. I do thank you for suggesting this to your team and understand that you can not provide an eta. But, I do need a more immediate solution to this problem. Can you please expand on the use of the hooks so I can add my own videos? You can use the above hooks to add video category and videos. Hey @Micha, were able to use the hooks to add video? If so, would you mind posting a snippet of example code? Honestly, I haven't even had a chance to try this. I'm still working on the core development of this site and I'm nowhere near the support development aspect. 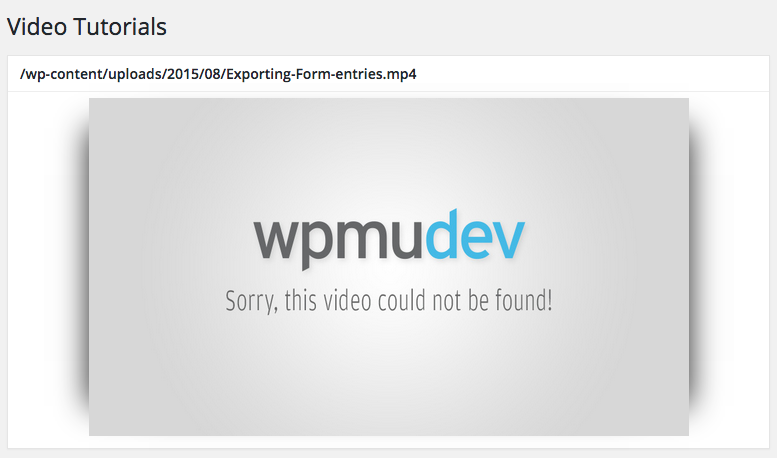 Frankly, I'm hoping the WPMU does a similar implementation that WP101 does before I launch. Otherwise, I'll just use theirs because it does this out of the box. They have a similar core group of basic videos, then an easy to use GUI that gives you a URL field for your video (hosted on Vimeo or similar). Once you add one, there's a plus button that lets you add another field and so on. Super easy to use and frankly, I'm a bit surprised that WPMU hasn't done something like this already. Anyways... sorry I don't have an example for you. Have you used Sidekick Pro? It's $3/mo per website (which will get expensive eventually) but seems to have a pretty nice interface for devs & users. I've seen it on a couple of sites that use ManageWP hosting services. I know people were up in arms about it being auto added to those dashboards, but I think I'm going to take it for a test drive. Vinod, can you please post a working example of adding a video to an existing category and adding a video to a new category? You can get an example of adding videos in the following reply. Hi Vinod, I noticed that snippet but I think I'm still missing the code required to add the videos to a new or existing category. Have you used that code? What do you think that you are missing something? If not then please share me the exact code that you are using. I'm using that exact snippet, but substituting my own video title and file path. Isn't additional code required to assign that video to one of the existing categories or a new category? For example there's nothing in that code snippet that would allow me to add the video to the "Pages" category. I have tested the shared code and it didn't work for me. It's displaying me the following warning message therefore i have notified my colleague @Hoang Ngo about this. He will reply on the thread regarding this and will also answer you how to add videos to specific category. Yet another reason for the WPMU community to build in a function to allow us to easily insert videos using the backend and not having to mess with the code of the plugin. Shouldn't be that hard to do this guys... really. Thanks Hoang. What additional code is required to get this video to show up on the Video Tutorials list? Would you mind creating new thread if you have your own question - this way we will be able to help you separately and more efficiently. Kasia, my question is no different than the one that started this thread. The issue is WPMU isn't providing an answer that works. //The URL to VIDEO, is the direct URL to your video. $cats = '<iframe style="display:block;margin:0 auto;box-shadow:30px 0 50px -30px #222, -30px 0 50px -30px #222;"
Hi Hoang, getting closer! The video is added to the list, but there are still a few issues preventing it from playing. The video is labelled using the video path. I guess using the video ID would be better if there's a way to insert a proper title that would be best. The video doesn't play, from the source it looks like it's not looking for the video locally. Guys... can't you see how convoluted this is? I would bet that almost all of your customers are your customers because they don't have the coding knowledge to do things like this. Yet, when presented with a problem, you just give us code. Also, while I can manage some code myself, the reason I want this feature is so that my support staff can produce, add, change, and remove custom videos as needed based on the site's requirements. How's that going to work? The original solution asked for was for you, WMPU, to add a function so that your users can add custom videos in the backend without coding. I even gave an example of another video training solution that does it. After further research, there are a few more out there that have this same feature too. This is because so many sites will have some custom things developed into it whether a custom post type, eCommerce, events system, etc. And we NEED to be able to add videos for our client in an easy way. Please stop all this back and forth with try this and try that. Instead, just develop this feature that all of your competition already has built into it, and for a good reason, and allow us to manage our websites in a more easy fashion. After all, that is what a software/development company is all about right? Making your customers lives easier through software? Sorry for the long rant, but this is just bugging me too much not to say something. I'm sorry you feel that way , and I can understand the frustrating. Unfortunately, the feature currently now out of the box, so I will move this thread to Feature & Request section, so the lead developer will get noticed, and he can consider for this feature. In the meantime, can you please send me your URLs, categories, video names and how it should be structured. I will implement the code to your site, make sure everything works properly, and then inform you. Hey. That's a great offer and I much appreciate that. You support has always been top notch and that's one of the main reasons I'm a customer. That said, my reasoning for insisting on this, is because this project will most likely require a fair amount of updating these videos over time. Because of this, it would be much easier if this feature was implemented. Thank your for giving this attention and bringing it up the ladder. I just read through this thread, I too would really like this feature implemented into one of WPMUDEV's Excellent array of plugins. I've also seen WP101's plugin which seems great (apart from the price tag) One of the excellent WPMUDEV's Selling points is its extra themes + plugin resources on top of the excellent support. So like Micha has put making an easy to use interface (even some kind of temporary workaround Add-on to the existing plugin to run in beta mode - on site owner's risk) until a fully resolved version can be released would be highly appreciated. Wow 50 sites is alot :slight_smile: Are they all doing similar things or is the plugin just to help out the site users ? Yeah... I'm rounding, but it's a lot. They're all pretty different unfortunately, which is why adding a custom video or two into the mix of these videos is so important to me. I do have a couple multi-sites in addition to that so, I'm fully aware of the benefits of multi-sites. However, there's reasons why these aren't multi-sites, the biggest being simply features and performance. Several of these sites are heavily customized and we just don't feel a multi-stir is the right choice. Anyways, that does bring up an interesting point though about this plug and multi-sites and it's something I haven't yet considered. If the feature was added to the plugin to allow custom videos, would that function for the entire network? Or would there be additional controls to allow the added videos to be enabled on a per site basis so that some users could see video X and others video Y for example. Not saying this has to be done, and I don't need that, but someone may. I have notified my colleague @Hoang Ngo to see it and reply here. Here is the updated code, can you please try? $cats    = '<iframe style="display:block;margin:0 auto;box-shadow:30px 0 50px -30px #222, -30px 0 50px -30px #222;"
Hi @Hoang, that did it thanks!